This is the "official" website of Eyler's Valley Chapel and we are thrilled to have you visit. You can check out the various pages and find out where we are located, why we exist, upcoming events and even a little of our history. We hope you enjoy the site and if you live near or are traveling through be sure to stop in and visit us in person. 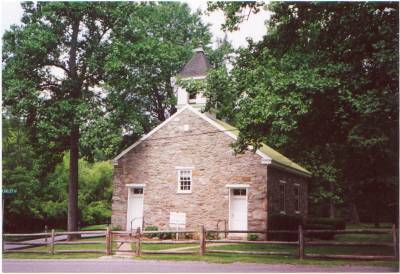 Nestled in a pristine valley in the Catoctin mountains, Eyler's Valley Chapel offers a unique and wonderful worship experience. 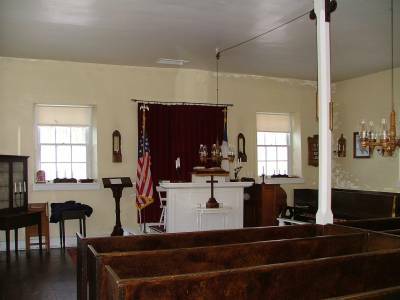 Located 6 miles from Thurmont, MD between Frederick MD and Gettysburg, PA, the chapel allows visitors to step back in time. Built in 1857, the chapel has no electricity: 72 candles glow with light, the treadle organ provides music, and the church bell placed in December of 1904 rings out the start of each service. Other than replacing the old coal stove with two gas heaters and keeping things cleaned up and painted, the chapel remains pretty much as it was a hundred plus years ago. We welcome you to join us for worship any Sunday evening at 7pm. In the winter services may be cancelled due to inclement weather. If you are using GPS navigation, enter 7504 Hampton Valley Road, Emmittsburg, MD into your GPS. Please note that this is NOT our mailing address. Find us on Facebook! Search for Eyler's Valley Chapel and don't forget to LIKE and Share. The chapel is a non-denominational house of worship that seeks to honor God through worship and service. Our congregation is made up of simple people whose lives have been changed by the The Savior as well as those seeking a refuge from the storms of life. The chapel has hosted visitors from all over the world. People who are in the area and hear about this quaint house of worship take time to stop by. If you are coming to the area or already live here, we would love to have you come and worship with us. We promise you will be blessed! During the Christmas season the chapel holds services starting in mid-December and culminating with 5 services Christmas Eve. The schedule will be located on the "Schedule of Events" page and is published in November. To read more about Eyler's Valley Chapel including a brief history click on the "About Us" tab. For schedule of services and special events click on the "Schedule of Events" tab. For information about weddings see the "Weddings" tab. For Picnic signup or other questions see the "Contact Us" tab.